Home Trainers	The Nike Air Trainer 1 ‘Draft Day’ QS makes a Mid go high-end. The Nike Air Trainer 1 ‘Draft Day’ QS makes a Mid go high-end. Looking at hip-hop sleeves from 26 years ago you’d assume that everybody dressed amazingly back then. But you’d be wrong — most gear was atrocious: acid washes, stonewashes, pastels, neons and flecked fabric aplenty. What’s odd, is that among the terrible attire from the feet up, it was a golden age for sports footwear. Sure, most people choked those shoes or beat them up, but the shoes from every key brand were generally on point. The Nike Air Trainer 1 is a perfect example of the era’s innovations — the mid-cut and forefoot strap made the shoe versatile, while the OG men’s colourway, with that sparing dash of green made a big difference. Cash Money and Marvellous made this one look good, but it also taps into the old Dapper Dan realm of “borrowed” monograms from fashion houses. 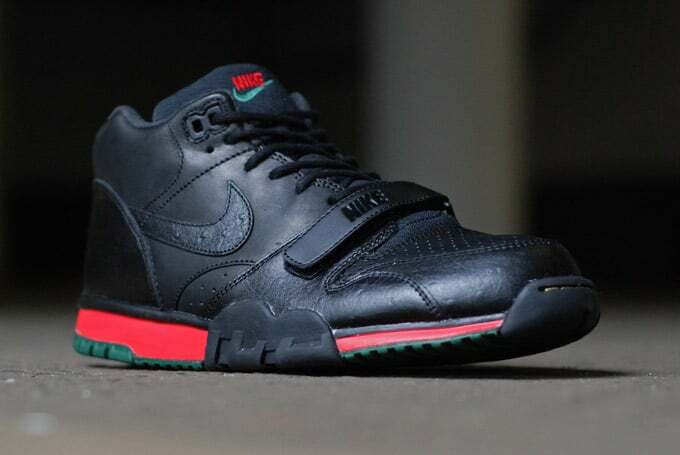 Looking at our Gucci, it’s about that time and this Quickstrike version of the AT1 applies that familiar green and red to the sole, with an all-black upper. Last year’s Safari version of this shoe was great (even if it was less subtle than the co.jp Safari nod of 2001) and this one sits alongside it, looking like a commission from the legendary Harlem home of fake branding as an artform. We can imagine these peeking from the shopfront while Mike Tyson and Mitch Green traded punches on the pavement outside back in the day, but they’re actually (allegedly) themed on draft day. Is that a reference to athletes wearing Gucci loafers for the special occasion? Draft day, with its big guys in weird suits with big shoulders and synthetic fabrics or the good old days of a fitted cap with a suit, is the perfect place for colourway and material execution inspiration, but this shoe is a far more tasteful approach and the leather is better than usual too. This Quickstrike is on sale in the Crooked Tongues store now.